If you are an avid golf lover, you will play in most weather conditions; whether it is raining, windy, chilly, or humid and hot. Because golf is a sport that is enjoyed outdoors, it is important to be prepared for any weather condition. Being prepared can save you from a great deal of hassle such as soggy shoes, wet clothing, or worse yet, a bad game. This article will highlight some tips for playing golf in the rain. To avoid getting frustrated by your hands slipping on your clubs as you swing in the rain, you will want to be sure that you wipe the grip and shaft after every shot to keep it dry. If you want, you can wrap a handkerchief or a small towel around the grip to maintain a dry and firm grip. It is also a good idea to bring extra towels with you so that you can cover the opening of your bag to absorb the moisture coming from the rain. If you plan to play in the rain often, you may want to consider purchasing a waterproof case for your golf bag. The umbrella will protect you from the wind and the rain. It will help shelter you from heavy downpours as you walk the course. Other useful ways to use your umbrella include to cover your clubs and golf bag from the rain and keep your golf towels dry. 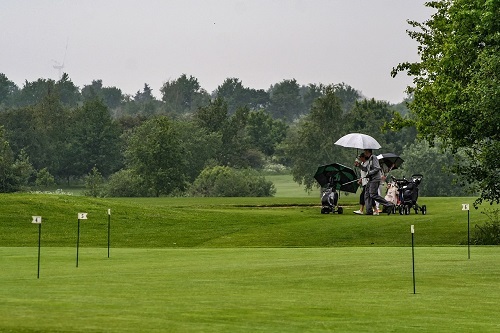 If you plan to golf on a regular basis, or you are in a golf league, it is a smart idea to invest in purchasing an umbrella that you can easily install onto the side of your golf bag or cart. This way you don’t have to worry about holding it throughout the day and you can stand under it in between holes more readily. Waterproof apparel is smart to have in your wardrobe. If you find that rain is in the forecast, you can wear your waterproof gear and not have to worry about getting wet all day on the course. Some of the items that are most useful in waterproof form are jackets, pants, and shoes. You will also want to consider investing in rain gloves as they will help you stay dry and avoid being distracted by wet hands while you are playing. When investing in waterproof apparel you should shop https://www.thegolfshoponline.co.uk/waterproofs/ for a great selection. You should take into consideration that your golf ball will respond differently to the weather on a rainy day compared to a warm and sunny day. For one thing, the number one hurdle most golfers face is the wetness of the ground, which ultimately affects the ball. To avoid negative results from the wetness of the course, try keeping your golf ball dry for as long as possible. Use extra towels to wipe the ball in between turns. If this is not feasible, be sure to have extra balls on hand so that you can use them in a pinch. This entry was posted in Other Sports and tagged Golf, Rain. Bookmark the permalink.